Grapevine (Pecan) Hole 3: This golf hole gets the award for being the closest to a lake without being able to see the lake. Due to the large dam/road that is to the right, the golf is literally only a driver from the lake, but has only a view of the dam. The dogleg left does feature a very difficult drive between a bunker and a lake. 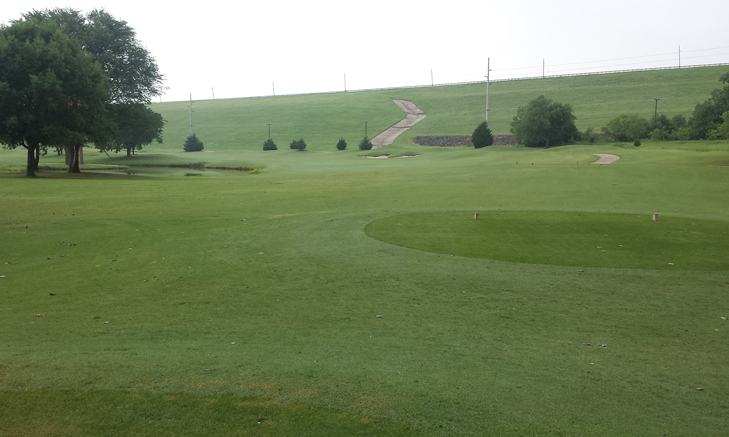 The second shot is to a well-guarded, but pretty flat, putting surface. Grapevine (Pecan) Hole 4: There are a couple of very tight tee shots on this course and this par five has one of them. The hole is dead straight and runs between very large trees to the left and the dam to the right. Grapevine (Pecan) Hole 6: Another very difficult driving hole, this one must be hit through a shoot of trees and avoid the lake to the right and the dense forest left. Except for the biggest of hitters, cutting the corner is really tough, which will leave a tough shot to the green with water short and right and bunkers left. 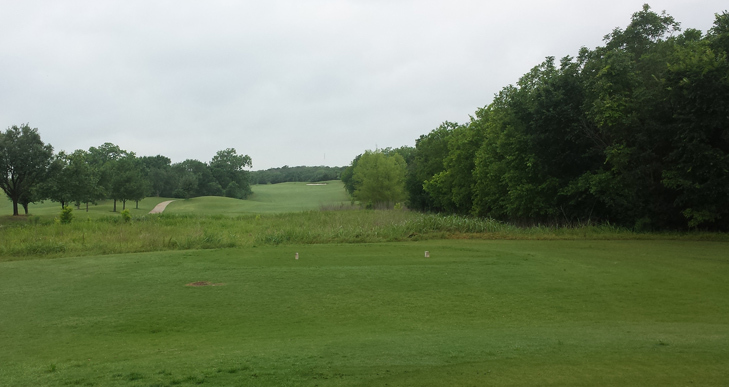 Grapevine (Pecan) Hole 7: This short par four has a lake to the left and trees to the right for the layup drive. If the player wants to hit driver, then there is a lake to the right and a bunker left. If the fairway is found, the green is fairly accessible to get a short chance at birdie. Grapevine (Pecan) Hole 9: Rarely does a par five hole have a forced carry over water from all angles, but this one does. If the player goes right, it's a much shorter carry, but there is forest and bunker over there as well. The straight drive over the middle-left of the lake gives the best shot at cutting yards off the hole. 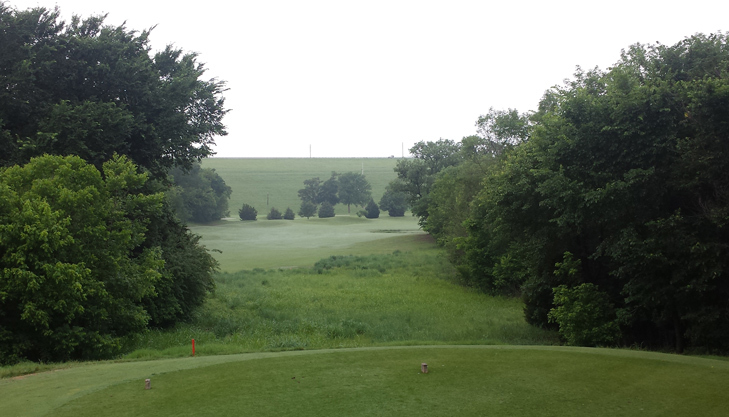 The green is then fairly flat, but the large tree to the front-right of the putting surface will grab errant shots. 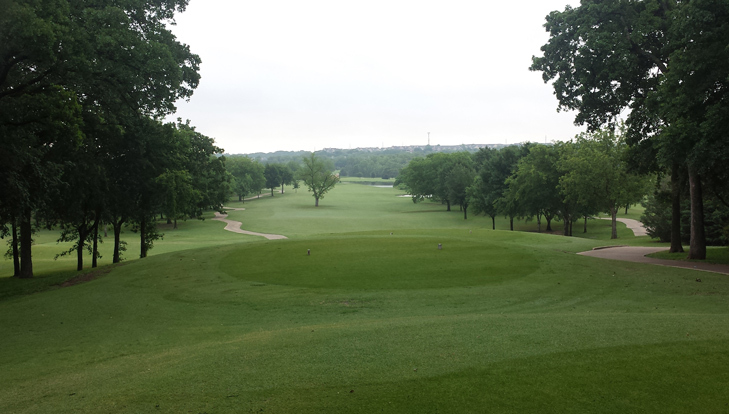 Grapevine (Mockingbird) Hole 3: This hole has a fairly straight-forward and wide tee shot landing area. Any pin center or front is no problem. However, the back-left pin is really nasty, over a deep bunker and with a steep hillside down for any miss to the left. Grapevine (Mockingbird) Hole 5: Basically a 90-degree dogleg left, the player can lay up straight off the tee, short of the bunkers to play it as a three shot hole or they can attempt to fly the trees at the corner of the dogleg to leave a much shorter shot to the green. There is a lake to the left near the green that has to be avoided. Grapevine (Mockingbird) Hole 6: The shortest par four on the course has a tight drive between two lakes. Supposedly, the big bomber could go for the green, but the surface is behind the water and does not leave much room over the green or right, so it's really risky. The layup tee shot will still leave a short iron to the green. Grapevine (Mockingbird) Hole 7: A pretty par three over water, the front pin is the most difficult with a bunker left and the slope short of the green that can bring balls back towards a watery grave. 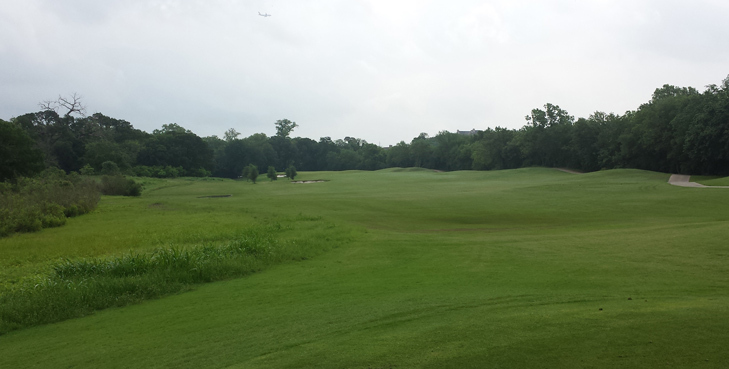 Grapevine (Mockingbird) Hole 8: The drive is over a small wetlands and is framed well by a large trees and sand traps. The approach is then to a green with water cuddling the right side, so care must be taken. 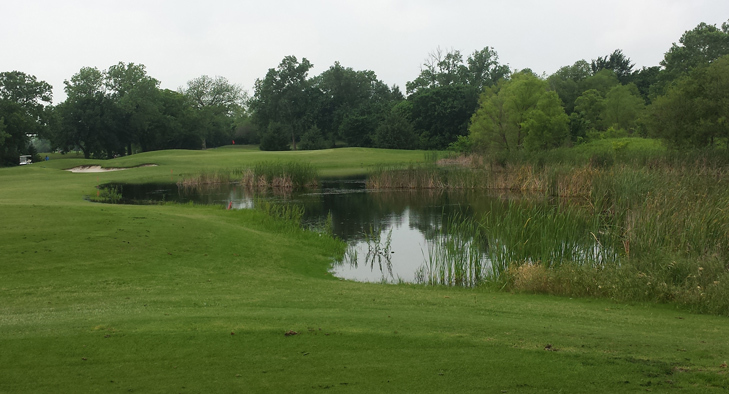 Grapevine (Mockingbird) Hole 9: More water greets the player at the finishing hole to this nine. The long hitter can carry the far side but if they pull it just a tad, it will be wet and there is no good drop. Going right is more safe for sure but adds some yardage. The green is elevated and there is an enormous bunkers short of it. Grapevine (Bluebonnet) Hole 1: This nine was my least favorite of the three loops but the first hole is a fun, downhill tee shot with a tree (not really in play for a decent drive) in the middle of the fairway. The hole bends left and the only real danger is water right on the second, but it is pretty far to the right. Grapevine (Bluebonnet) Hole 5: The other par five on this nine is uphill with a pretty tight drive between trees. Then, the hole bends left to a green that (I think) is at the top of the property with good views of the area.